Thank you so much for helping us achieve our fundraising goal for our March 7&8th company debut concerts! We couldn’t have done it without you! To celebrate this new beginning, we would like to invite you as a special guest to the closing exhibition of “The Fairytale Project” – a collaborative multimedia exhibition by choreographer Shandoah Goldman and photography by our company’s visual director, Athena Azevedo. 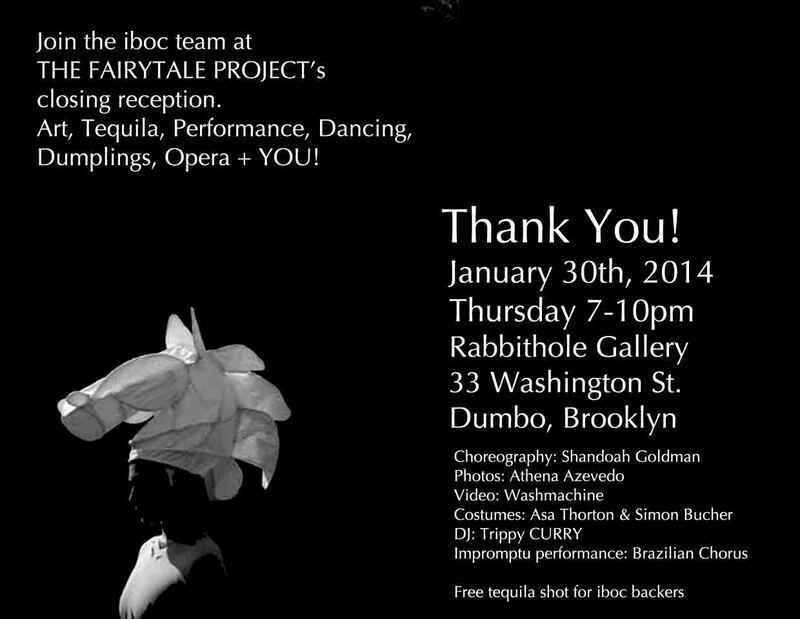 We’ve arranged for iboc Kickstarter backers to have a free tequila shot by the sponsor Tequila Clase Azul and we will have Chinese New Year’s Eve dumplings for those who arrive early. ⟵You are Fantastic! Thank you for believing in us! Obrigado Grazie! Arigato!